Miss Seattle showers? 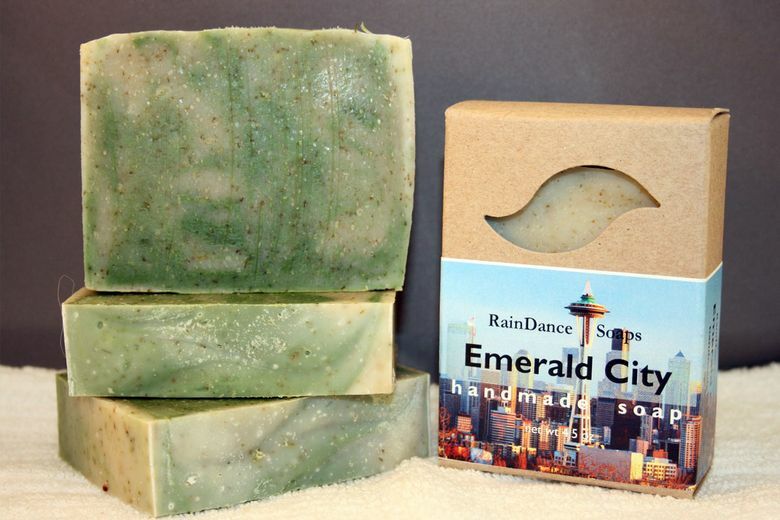 This soap from SeaTac has local rain as a key ingredient. Do you miss the rain? Cool off in the shower with luxurious RainDance Soaps, handmade in SeaTac using filtered rain, collected locally in 50-gallon rain barrels and filtered through cheesecloth or unbleached muslin. RainDance uses organic, Seattle-area ingredients whenever possible, including local honey, raw goat milk, edible natural oils and herbs grown on its own property. The soaps smell delicious and are gentle enough for sensitive skin (there are facial soaps made specifically for the face). A wide variety of scents are available with fun local names, including Alki Sunset, Elliott Bay Rum and Emerald City.